It’s almost time to unwelcome NATO! Watch and share this new video about our upcoming events on April 3rd and 4th. Our plans for an awesome peace festival on April 3rd include an amazing lineup of speakers, musicians, comedians, nonviolent action trainers, and facilitators of artistic creation in preparation for April 4. We’ll be livestreaming from 5:00 to 7:00 p.m. and 8:00 to 10:00 p.m. ET at youtube and facebook. There is more false information in the US mass media than there is the truth. The people of the United States are being misled in order to create support for the Trump intervention in Venezuela which includes the economic war, an attack on the electrical system and the threat of war and militarism. We will report on what we saw in Venezuela. When the US was claiming there was widespread civil unrest when in fact there was calm. When the US claimed there were people starving and homeless, we saw healthy people, food distribution programs, urban food gardens and millions of social housing units built in the midst of an economic war. There were no starving Venezuelans. The peace delegation was organized by the US Peace Council and COSI (the Committee for International Solidarity). We spent time in the barrio’s, shantytowns, on the streets, food cooperatives and at rallies and talked to many Venezuelans. We will also report on a 90-minute private meeting our delegation had with President Maduro, as well as meetings with the National Electoral Council, the Foreign Ministry, the Ministry of Urban Farming, Ministry of Peace and the Health Ministry. Join us so you can learn what is really happening in Venezuela and share the information widely. U.S. Peace Council in Venezuela. Send it to your TV and newspapers and all your social media. We must stop the US from doing this to Venezuela. The Black Alliance for Peace joined activists from peace organizations based in the United States to embark as a delegation to Venezuela to uncover the truth. They are reporting to you today, the day they were supposed to fly back to the United States. While American Airlines refuses to fly to Venezuela because of so-called danger, this delegation found the embattled country pleasant and safe. An NGO responsible for reporting on war deaths in Yemen has acknowledged that it has underestimated the casualties in the three-year-old conflict by at least five to one. Armed Conflict Location and Event Data Project had originally estimated that about 10,000 people had been killed in the war in Yemen, roughly the same number reported by the World Health Organization. WHO surveys are regularly cited as estimates of war deaths in Yemen by UN agencies and the world’s media. But ACLED now estimates the true number of people killed in Yemen is probably between 70,000 and 80,000. ACLED’s estimates do not include the thousands of Yemenis who have died from the war’s indirect consequences, such as starvation and preventable diseases like diphtheria and cholera. UNICEF reported in December 2016 that a child was dying every 10 minutes in Yemen, and the humanitarian crisis has only worsened since then. At that rate the total of all deaths caused directly and indirectly by the war must by now be more than one hundred thousand. Another NGO, the Yemen Data Project, revealed in September 2016 that at least a third of Saudi-led airstrikes, many of which involve U.S.-built and (until Friday U.S.-refueled warplanes) using U.S.-made bombs, were hitting hospitals, schools, markets, mosques, and other civilian targets. This has left at least half the hospitals and health facilities in Yemen damaged or destroyed, according to the Yemen Data Project, leaving them hardly able to treat the casualties of the war or serve their communities, let alone to compile meaningful figures for the WHO’s surveys. Even comprehensive surveys of fully functioning hospitals would capture only a fraction of the violent deaths in a war-torn country like Yemen, where most of those killed in the war do not die in hospitals. And yet the UN and the world’s media have continued to cite the WHO surveys as reliable estimates of the total number of people killed in Yemen. In a three-part series for Consortium News in April, I claimed that such estimates of civilian deaths in U.S. war zones were likely to be dramatically wrong because that is what epidemiologists have found whenever they have conducted serious mortality studies based on well-established statistical principles in war zones around the world. Epidemiologists recently used some of the same techniques to estimate that about 3,000 people died as a result of Hurricane Maria in Puerto Rico. Studies in war-ravaged Rwanda and the Democratic Republic of Congo have been widely cited by Western political leaders and the Western media with no hint of controversy. Some of the same public health experts who had worked in Rwanda and Congo used the same methods to estimate how many people had been killed as a result of the U.S. and U.K.’s invasion and occupation of Iraq. In two studies they published in the Lancet medical journal in 2004 and 2006, they found that about 600,000 people had been killed in the first three years of war and occupation. Broad acceptance of these results would have been politically disastrous for the U.S. and UK governments. It would also have further discredited the Western media that had supported the invasion of Iraq and were still blaming the Iraqi victims of the illegal invasion of their country for the violence and chaos of the occupation. The British Defence Ministry’s chief scientific advisor described theLancet studies’ design as “robust” and their methods as “close to best practice,” and British officials admitted privately that they were “likely to be right.“ The U.S. and UK governments nonetheless launched a concerted campaign to discredit them. Roberts, at Johns Hopkins School of Public Health at the time of the 2004 study and now at Columbia, accurately said there was no legitimate scientific basis for the objections being raised to his work and its results. But it was not so odd that embattled political leaders would use all the tools at their disposal to try to salvage their careers and reputations—and to preserve the U.S. and UK’s future freedom of action to destroy countries that stand in their way. By 2005, most Western journalists in Iraq were hunkered down in Baghdad’s fortified Green Zone, reporting mainly from the CENTCOM briefing room. If they ventured out, they were embedded with U.S. forces traveling by helicopter or armored convoy between fortified U.S.bases. Dahr Jamail was one of a few brave, un-embedded Americans reporting from Iraq. (He later named his book about his time there Beyond the Green Zone.) Dahr told me he thought the true number of Iraqis killed might well be even higher than the Lancet studies’ estimates and that it was certainly not much lower, as the Western propaganda machine insisted it was. Unlike Western governments and the Western media in the Iraq case, and UN agencies and the same Western media in Afghanistan and Yemen, ACLED does not defend its earlier, inadequate estimates of war deaths in Yemen. Instead, it is conducting a thorough review of its sources to come up with a more realistic estimate of how many people have been killed. Working back from the present, it now estimates that 56,000 people have been killed since January 2016. Andrea Carboni of ACLED told Patrick Cockburn of The Independent newspaper in Britain that he believes ACLED’s estimate of the number killed in three and a half years of war on Yemen will be between 70,000 and 80,000 once it has finished reviewing its sources back to March 2015, when Saudi Arabia, the U.S., and their allies started the war. But the true number of people killed in Yemen is inevitably even higher than ACLED’s revised estimate. As I explained in my Consortium News report, no such effort to count the dead by reviewing media reports, hospital records, and other “passive” sources, no matter how thoroughly, can ever fully count the dead amid the widespread violence and chaos of a country ravaged by war. This is why epidemiologists have developed statistical techniques to produce more accurate estimates of how many people have really been killed in the world’s war zones. The world still waits for that kind of genuine accounting of the true human cost of the Saudi-U.S. war in Yemen and, indeed, of all America’s post-9/11 wars. A earlier version of this article appeared on CounterPunch. On the face of it Mr. Starr’s point seems obvious. But if so why has the United States engaged in seemingly endless war in places like Vietnam, Panama, Grenada, Afghanistan and Iraq, since Mr. Starr’s song hit the charts? Why are policy makers in Washington D.C. fomenting for more war in Venezuela and Iran? Apparently, war is good for something as the U.S. continues engaging it. Perhaps our policy makers, being graduates of Ivy League schools, know something of war’s benefits of which mere commoners are unaware? Perhaps they believe endless war is a means to maintaining and sustaining the affluent lifestyle we enjoy in the Unites States? While it is true that companies like Raytheon, Boeing and Lockheed Martin make many billions of dollars manufacturing and selling their weapons to the Pentagon and countries like Saudi Arabia, profits are concentrated in the hands of the 1% – the CEOs and shareholders. War is “good” for them. Not so much for the rest of us. Certainly not for people on the receiving end of those weapons, like the war-torn victims of Yemen. So it turns out, while war may be “good for” CEOs and shareholders of war profiteering corporations, it’s not for the rest of us. Taxpayers would get a bigger bang for the buck if we funneled money away from the Department of Defense and instead poured that money into funding Medicare for all, free college education, repairing and replacing our nation’s crumbling infrastructure, and enacting a “Green New Deal.” It would produce more and better jobs. And best of all, no more bombs ripping through school buses in Yemen. Okay, but surely Americans are wealthier and happier because of our bellicose belligerence, right? Surely we enjoy lower “prices at the pump” and have a greater sense of security because of our endless wars? The U.S. contains roughly 5% of the world’s population but consumes nearly 30% of the world’s natural resources. If the rest of the world consumed like us we’d need several more planets to sustain all that consumption. Even with all this consumption, the United States did not make the top 10 list of the World Economic Forum’s “happiest countries in the worldLinks to an external site.” in 2018 (we were 18th). That honor went to Finland, followed closely by Norway, Denmark, Iceland, Switzerland and the Netherlands. The U.S. did lead the field in one area – anti-depressant use. Clearly endless war isn’t making us happier or more secure. In fact, the imperialist policies of the United States make Americans less secure. It may seem strange but most people resent invading armies, drone strikes in the middle of the night, and covert CIA operations toppling their elected governments. That tends to make enemies, not friends. Imagine the friends the United States would have the world over if we spent even a third of the trillion dollar (yes, with a “T”) defense related budget to provide medicine, food, shelter, roads, bridges, and education to countries we presently bomb or occupy with military bases? Rather than being viewed as the most threatening country to world peaceLinks to an external site., the United States would be the most loved. Bloated “defense” budgets and endless war does not produce “good jobs,” does not make us wealthier or happier, and does not make us more secure. 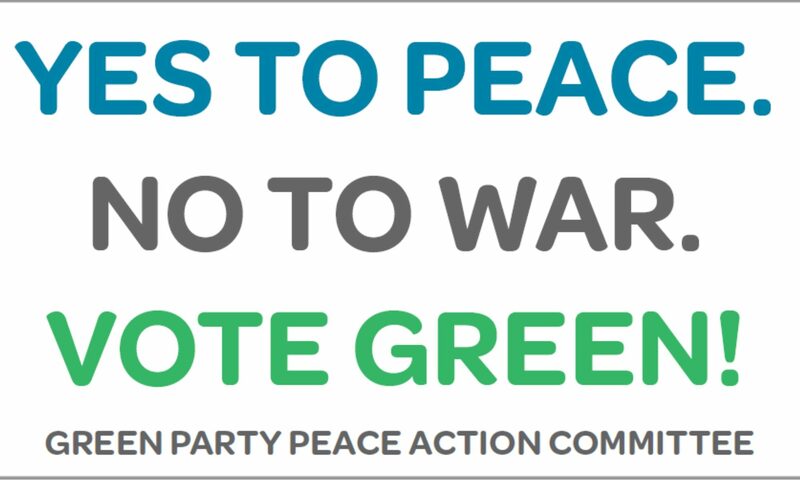 The Green Party Peace Action Committee (GPAX) has endorsed back-to-back anti-war demonstrations in DC. (see below.) These actions are important and we would like to have a strong Green Party presence. There will also be local peace actions we need to support and help organize. “From Yemen to Venezuela US Aggression Must End”. There is a great need for peace education and outreach. Most Americans have little understanding of why we are at war and are fatigued by how long these wars have been going on. The peace movement needs to reach out to new constituencies.. I propose that we encourage peace groups to organize anti-war teach-ins on college campuses and in communities in the coming months. SATURDAY, MARCH 16: See below. Mobilization to Oppose the North American Treaty Organization(NATO). NO to intervention and war from the U..S. and their proxies in the region.